For the better guidance and governance of a country, a system of rule is needed. This system of rule is called a constitution. 26 January 1950 was the golden day on which the constitution of India came into effect. This constitution grants every citizen some rights and duties. A vast and diverse country like India needs a proper constitution. This constitution needed the combined effort of drafting committee which took 2 years 11months and 8 days for making the best and the longest constitution in the world. The constitution has been calligraphed and not printed and it is safely stored in helium-filled cases. The constitution has been written in English as well as Hindi. Our county gained independence on 15 August 1947 after millions and millions of Indian sacrificed their precious life but till then we had to be ruled by the-government act. It was 26 January 1950 when India made a big transition to a secular, sovereign and democratic republic. It was the day when we got our rights, the rights which made our life worthy. We have the right to speak, take up the work which we like, reside where ever we want in India, follow our dream irrespective of caste and gender, follows any religion and the best of all to select the ruler of our choice. Every special day has a significance and hence every special date has a concealed meaning. On 26 January, Indians for the first time demanded Purna Swaraj or complete independence from the British rule. The 26 January 1930 was declared as Purna Swaraj Diwas. We celebrate the republic day to honour the struggle undertaken by our freedom fighters. Every year we have a joyful celebration held at India gate. Large military parades, traditional dance troops, members from our Indian army, navy and air force take part in this auspicious day. The prime minister lays a wreath at Amar Javan Jyoti to salute the soldiers for their valour. Awards and medals are given to the civilians for their bravery. The song ‘Abide with me’ is played as it was Gandhi Ji's favourite. All the participants of parade get ready and reach Rajpath by 3 am but the preparation begins in the month of July of the previous year when participants are informed about their participation and event. The participants practice for 600 hours before the formal performance. The ttableaus in the parade move with the speed if 5 km /hr so that people can observe them. It is the endless toil of these people who make this day remarkable. I salute my country, my India, my Bharat, my Hindustan by saying ‘Maa Tujhe Salaam'. The diversity we find in India is astonishing. India is just like a mini world. It has desert, snowy area, swampy area, mountains, plain and plateau. Almost every mineral, element, weather condition and beauty is present in a country of 3.28 million kilometers. 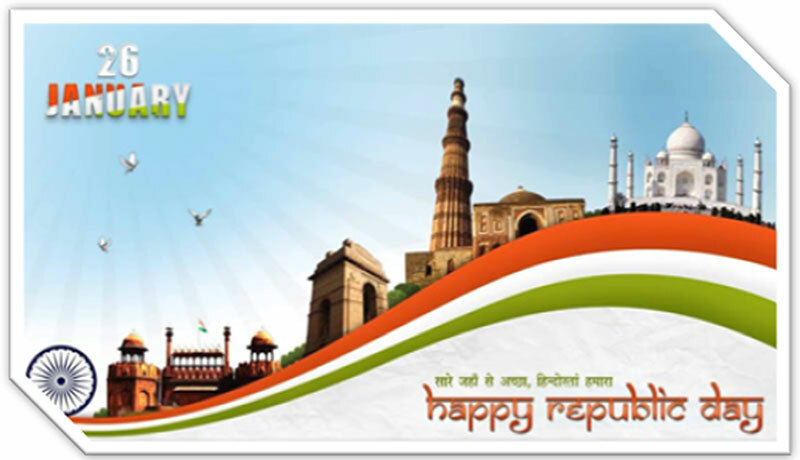 The Republic day is the day when we got our rights to live independently and freely. This unique day requires a unique celebration. We celebrate the day with merriment and unity. Together the Indian family of 1.35 billion members honour the toil of Indian fighters and drafting committee who prepared the best constitution for us.